Can you play and study at the same time? Now it’s possible as MCAST and university students take up MITA’s challenge to gamify learning and test it out in the real world. Meeting young students who have ambition, ideas and a clear vision of what they want certainly dents the cliched view some may have of them as fun-seekers who spend most of their time doodling on their smartphones. Now in their first weeks of work since the start of their gamification project at the Malta Information Technology Agency’s Innovation Hub in Smart City Malta, the nine students making up the SquareScope and Oddingo start-ups are living testimony of how unwise it is to jump to conclusions. The two start-ups won a call for proposals published by the MITA Innovation Hub last April. Their job is to develop three digital serious games covering the gamification of three thematic areas: learning science subjects, national history and information security awareness. The games will be used by secondary school students between the ages of 13 and 15. Made up of four gamers and one designer, SquareScope are building an exciting game about the Great Siege. For the game, they need to create a concept based on the epic clash of 1565 between the Ottoman besiegers and the Knights Hospitallers and their army of Maltese, Spaniards and Sicilians. The game’s name is To the Bastions! The team’s most difficult task is to get the historical facts right. Mark Andrew Azzopardi, the artistic designer of the group, says they are constantly in touch with Heritage Malta to make sure they are in line with the facts and events. “Sometimes the information we find on search engines is not always accurate, so to ensure everything is correct, we crosscheck data with Heritage Malta,” he says. Being a battle game, To the Bastions! is based on strategy. “This is the first game of its kind in Malta related to such a historical event,” they say proudly. One can feel a sense of ownership when the group talk about it, and their eagerness is evident both in the way they talk about the project and the wire-frames and designs on their desks. A curious aspect of this project is watching the gamers simulate the game on paper. Nick Mifsud, one of the coders, explains that even if rudimentary, this method is actually very useful to help code the game correctly. 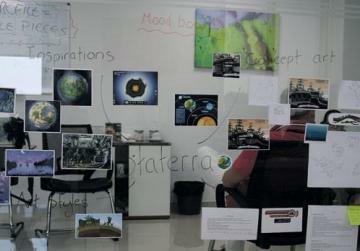 Oddingo are working on the other two games: Staterra and Netizen. 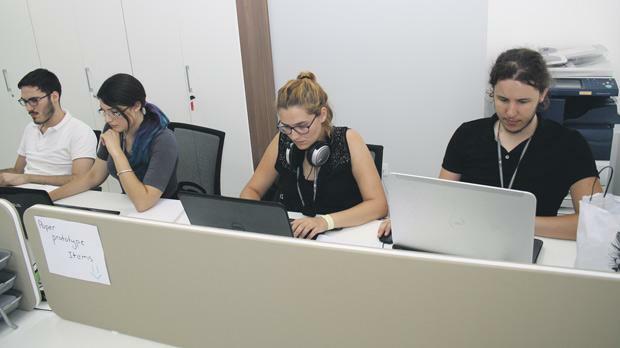 Even if all four members of the team are Master’s students at the Digital Games Institute of the University of Malta, they each have a different educational background when compared to the other team. In fact, one has a first degree in philosophy and another in psychology. The team includes external members who help out with the art and animations. Yasmin Cachia and Chris Zammit explain that the idea of Staterra is to educate third and fourth formers about predator-prey relationships in various ecosystems, one of which is the Maltese garigue habitat. The team tries hard to negotiate their innate desire for perfection with practicality, as the time available to develop the game is only 11 weeks. They have also created a mood board to guide and inspire them. They are working on three habitats: underwater Mediterranean (rocky beach and sea), garigue (small trees, large shrubs), and tundra (snowy plains, mountains and marine life). Asked about their progress on the information security awareness game, the teams say their main focus for now is on Staterra since it is the first product they have to deliver. But the main aim of the second game they have to deliver is to sensitise teenagers about the need to be aware of the dangers of the internet if no precautions are taken. Both teams are currently testing their prototypes to ensure that games are pitched at the right level and that they provide a good learning opportunity for the students. The launch of the games is planned for the next scholastic season during which students will be able download the games and explore their subject while having fun. Perhaps studying the way we once knew it is in for a good shake-up in the years to come. Only time will tell.